So, this is the newly remastered version of the second solo album from Robert Calvert. I’ve got both the last version and this new one. I can tell you listening to them side by side that there is quite a difference. This one has a richer sound and I’d recommend it over the other one. That’s basically the thing to know here because beyond that they are the same set. For that reason, what follows is my original review of the previous CD pressing from a few years ago and a different label. Just remember, the Atomhenge version is the superior one. 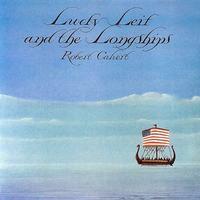 Lucky Leif and the Longships was the follow up to Robert Calvert’s Captain Lockheed and the Starfighters. Those hoping for a repeat of that album were probably disappointed. This one isn’t as cohesive as that disc. It’s a lot less Hawkwind-like, too. That said, there is a lot of strong material here, and the quirky pop goes weird (production by Brian Eno might have had something to do with that, too) approach is cool. Once again, some Hawkwind alums show up. This time in the persons of Simon House (violin), Nik Turner (saxophone) and Michael Moorcock (banjo). This might not be as easily accessible as Captain Lockheed…, but it’s worth the effort. This reissue includes a couple previously unreleased bonus tracks. A dramatic little intro that calls to mind the sounds of old starts it up. Then it pounds out into a hard rocking space rock section that feels a bit like Hawkwind. The vocals are subdued as the song continues. It gets quite noisy at times. Here’s Calvert’s take on a Beach Boys sort of vibe. It’s still got some Hawk-like sounds and is twisted a bit weird, but I don’t like the Beach Boys, so I’m not crazy about this one. This is more like it. It feels like it could have come from the first solo album. It is dramatic and slowly building with a rather chanting kind of vocal line. It powers out later into a more pure progressive rock jam. This is based on an echoing, layered spoken vocal section. This is a sound that has been heard by Hawkwind at times. It’s quite an interesting motif. There are no musical instruments heard. Instead all the sounds are from these layered voices. We get a cut here that’s very much a bouncy sort of psychedelic pop. It’s not that far removed from something by Syd Barrett era Pink Floyd. Combine such bands as T Rex and Sweet with a bit of blues tinge and a sound that’s decidedly Calvert-like and you’ll have a good idea of what this tasty number sounds like. It’s fun and a change of pace. It’s got a real groove and the wailing harmonica adds a lot to that bluesy presence. There’s a downhome folk meets country texture to this. Still, it has that odd Calvert twist to it. The arrangement here is more stripped down, but this is a song that’s more in keeping the music from Captain Lockheed... As the title suggests much of the vocal arrangement is in a chant form. Saxophone leads this off and the cut carries on in a weird, but quite tasty jazz meets roots rock and Calvert strangeness pattern. The vocals actually bring in some reggae.. This is literally a bunch of found sounds (basically television bits) worked around in a loop pattern. A more pure rocker, this one feels like it would have fit nicely on the album that preceded this one. The bass line, though, is rather funky. The first of two bonus tracks, there’s a bit of Rolling Stones groove to this, think “2000 Man.” It’s got plenty of trademark Calvert on show, too. As the title suggests, there is a lot of reggae in this number. It’s a bouncy little cut that’s a lot of fun.